The internet has become a growing force multiplier for businesses. An ever increasing number and variety of products and services are offered online, and more and more European households have broadband internet access to buy them. In 2015, broadband connections generated a revenue of approximately 7.8 billion euros in Spain alone. The entire internet and communications technology industry's revenue in Europe amounted to an estimated one trillion euros. In the recent past the telecom service industry revenue in Europe grew to nearly 270 billion euros, with slight annual fluctuations. The telecommunications industry revenue in the UK amounted to 37.5 billion British pounds. The German internet industry's revenue from services and applications is forecast to be close to 3.7 billion euros in 2017. Aggregation and transaction, as well as network infrastructure also contributed to the internet industry revenue in Germany. The industry is expected to employ approximately 330,000 individuals in Germany by 2019. The internet is the basis for a vibrant e-commerce market in Europe. The UK and Germany are the most developed part of the European market. In the UK the share of internet users who shopped online amounted to over 80 percent in 2015. Germany is predicted to have practically the same penetration rate of of 81 percent by 2020. In the UK the share of online retail sales is estimated to reach 17.8 percent in 2017, in Germany approximately 15 percent. Average annual online shopping spending per capita in 2016 came to 1,118 euros in the UK and 676 euros in Germany. However, companies in Ireland had the highest e-commerce revenue share, despite the country being a less developed market overall. The internet also offers an active advertising platform. Worldwide online advertising revenues amounted to approximately 154 billion U.S. dollars in 2015. 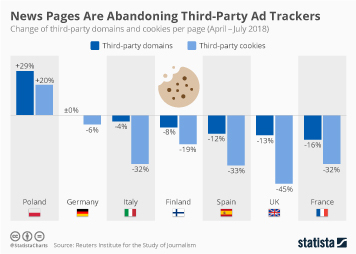 In the same year, online advertising revenue in Germany amounted to 6 billion euros. Spanish online advertising revenues reached a total of 668 million euros in 2015. Digital advertising in the UK generated a revenue of 13.2 billion U.S. dollars. More interesting topics from the industry "Advertising & Marketing"